I hate lotion. I hate it so much that even when I have dry skin, I put off using it for as long as possible. I have never liked to use lotion for as far back as I can remember. The sticky, slimy, greasy, mess is just something that I have never enjoyed. Unfortunately, AJ was blessed with not so great skin and has to use lotion a lot. The lotion recommended by the dermatologist is expensive and still leaves her skin dry! 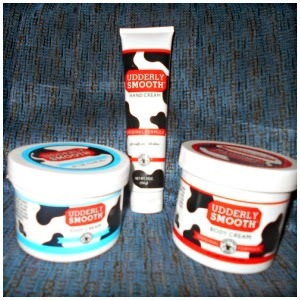 So, when I was given the opportunity to do a review for Udderly Smooth, I was excited. 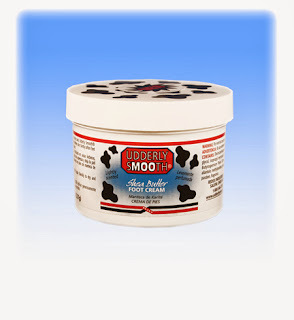 Udderly Smooth is the lotion with the black and white cow spots. It was originally developed in Ohio to be used on dairy cows and is now used by people world wide on dry and chapped skin. I was given the opportunity to try the hand cream, foot cream, and body cream. The body cream is a soft white cream that is non-greasy with a fresh scent. It moisturizes your skin leaving it soft and smooth. I used the body cream on AJ and it soaked right into her skin. I feel that it actually works better than the expensive lotion recommended by her dermatologist. We also tried it on my grandma’s face where she had some dry spots, by the next morning the spots were soft and smooth. The best part for me was that my hands didn’t feel sticky and slimy after I put it on them. This will definitely be a keeper in our house. The foot cream was amazing! My mom is diabetic so I often rub her feet and the foot cream made it an enjoyable experience for both of us. She actually said, “I love this lotion!” It left her feet smooth, but not greasy. It also helped with the cracking on her heals. The foot cream is a little bit thicker than the body cream and has a similar fresh scent. The hand lotion worked great too! In fact I put it on right before typing up this blog and have had no problem. With other lotions there would be no way that I could type after less than a minute of putting it on. People have used these products for a number of different uses from dry skin to sunburns. The products are available online and at various retailers including Walmart. Prices vary depending on where you purchase it, but they are a great value. Overall this lotion is wonderful. It goes on smooth and is not at all greasy. It is something that we will be using from now on in our home. It is a product that I would recommend in a second. If you have dry chapped skin look for the black and white spotted bottles! Find out what others had to say by clicking on the graphic below. 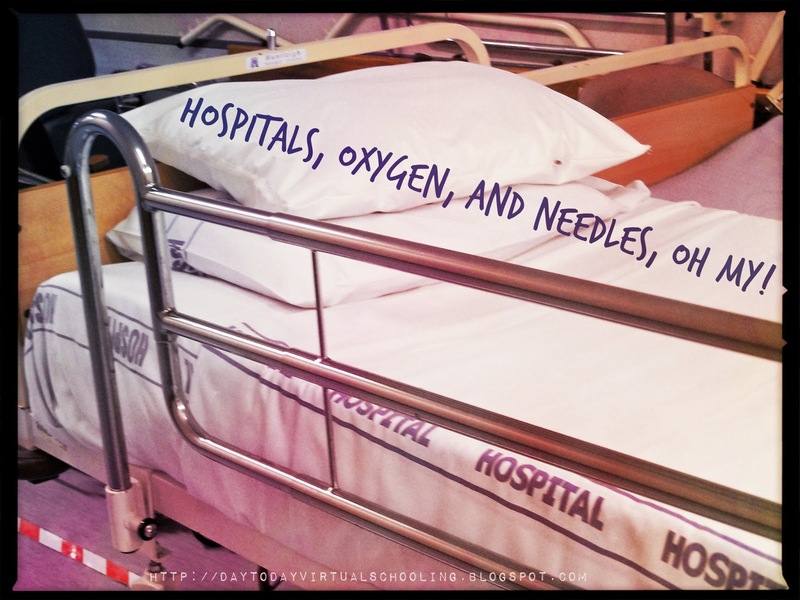 Hospitals, Oxygen, and Needles, Oh My! First I would like to say that I don’t think I will be participating in any more daily blogging challenges. Every time I do something big in my life happens and makes it to where I just can’t get to my blog. Now that things are a little bit back to normal I think I should be able to get back into my blogging grove. I mentioned before that we were staying with my grandma because she was put on oxygen and could no longer be left alone. Well she ended up having to go into the hospital for a few days because she had gotten worse. When they released her from the hospital she just did not look good. She was in a lot of pain and crying all of the time. One night it got so bad that she asked us to call an ambulance to help her because she couldn’t handle the pain any more. It turned out that she had multiple blood clots in both of her legs. It was so bad that she could barley move. You would think that they would have admitted her to the hospital, given her blood thinners and let her get better. No, they sent her home! They said to just give her an aspirin every day and put her on more pain medication. We reluctantly took her home and a few days later had to call the ambulance again. This time when they said she could go home because she wasn’t sick enough to stay at the hospital, we knew that there was no way she was able to go home. They ended up sending her to a rehabilitation center. I really think that they saw an 83 year old woman who couldn’t move and was hurting all over and thought it was normal. My grandma isn’t like that. Until we had to put her on the oxygen she did everything. She walked around the mall, took out her own trash, made her bed every day and was very independent. Besides the memory problem she was doing very well. At the rehabilitation center they started her on the blood thinners, did physical therapy with her, and made sure she was eating. She was so sick when she went in there that we thought she might not ever come out. Thankfully we were wrong and she came home yesterday. They took her off of the oxygen because she no longer needs it, she can walk with the use of a walker, and other her legs hurting she is doing well. The only thing that isn’t great about her coming home is that the blood thinners she is on came in the form of an injection. So every morning I have to give her a shot in the stomach and she HATES needles. I gave her the first shot this morning and she was cooperative so we will see how it goes. It has been a long process and I am so glad that she is back home. I hope that she continues to get better and stronger each day. The other day when we went shopping AJ declared like she does a lot of the time, “I am going to stop eating junk food and eat healthy foods only.” She actually eats fairly healthy and loves fruits and vegetables. She loves candy and sweets though and would eat them all the time if I let her. As we were shopping she handed me this box of Pop Tarts and said, “These are healthy, will you buy them for me?” I laughed so hard. Then I asked her why she thought that a pop tart was healthy. She went on to tell me how it was made of real fruit so that meant it was healthy. Indeed the box did say it was baked with Real Fruit. That statement of course was followed by an *. So I took that moment to explain the meaning of the little sign. 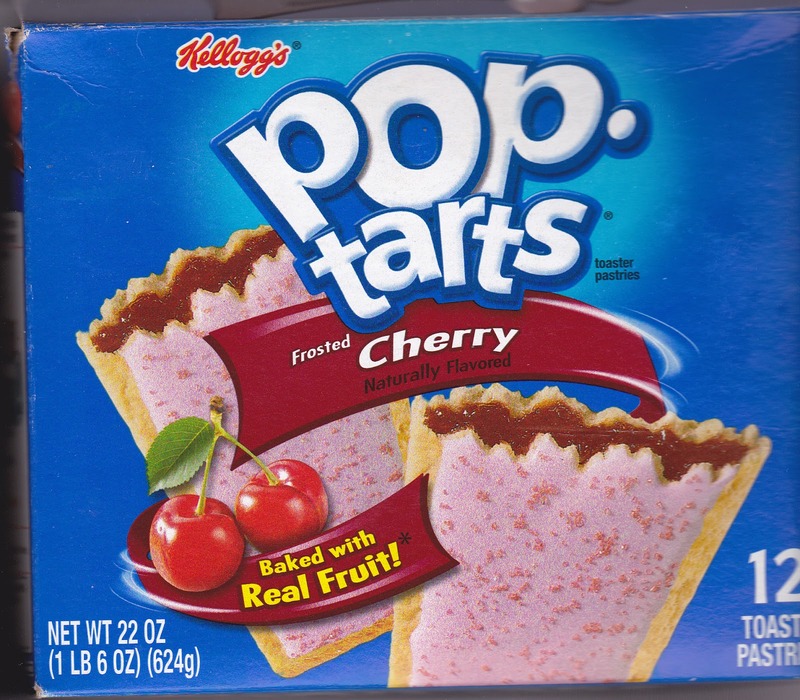 We then looked all over the box and finally found out that the filling is made with equal to 10 % fruit. We then looked at the long list of ingredients which included corn syrup, high fructose corn syrup, and sugar. 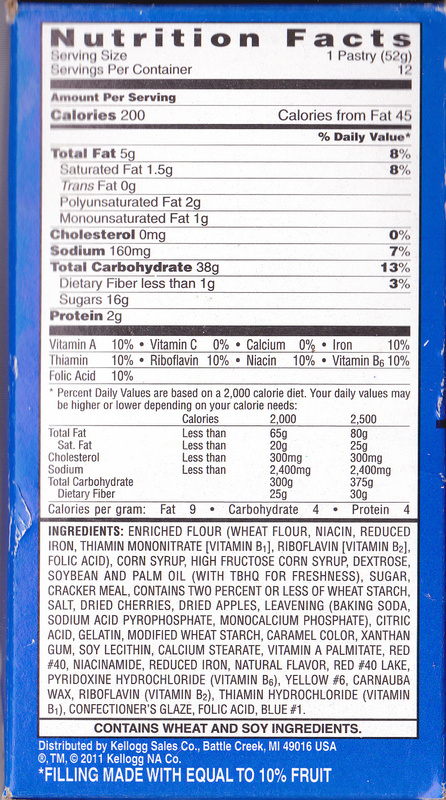 Then we looked at the nutrition facts and learned that for just 1 pop tart it was 38g of carbohydrates, 200 calories, and 16g of sugar. We went on to talk about how in advertising they put what they think you want to know in big writing and make sure it is visible. Where the information they hope you skim over or that they don’t wish to advertise they put in smaller writing and make you look for it. I love those times when life gives us the chance to learn about something that I hadn’t even thought about. Our plans for Valentines day didn’t go exactly as we had planned. My mom wasn’t feeling too well so she slept in and we started our day off a little later than we wanted to. It started with me waking my little one up. She woke up on the right side of the bed and happily got in the shower. While she was taking her shower, I made breakfast. I made her red scrambled eggs, toast that said I love you and pink milk. She loved it. It was just little food color, but she thought it was the best breakfast ever. (I didn’t get any pictures) Then she got dressed and I fixed her hair for gymnastics. After everyone was ready we went to take care of my grandma. I was pleasantly surprised to see her in a good mood as well. We went through her mail and took care of a few things then we went to lunch. Now I have been living with a corn allergy for a while, and have been watching everything that I eat but Thursday I made a mistake. We went to Joanne’s, a restaurant close to my grandma’s that we go to almost every week. I ordered a steak sandwich and didn’t think to ask for it on sour dough bread. I always ask for my sandwich on sour dough because I know I can eat it without being sick. The bad part is that once it arrived I still didn’t think anything of it and part way through the sandwich I realized my mistake. The sandwich came on a hogi type roll which must contain either baking powder (made from corn), corn syrup, or corn starch. I got so sick. Luckily I was ok after a while and or day went on. Then we dropped grandma off and went to the gym. My little one was so excited to hand out her goodie bags. Don’t you just love the glasses? She received so many complements on them. She was at the gym from 3 to 6 and worked very hard. They have their first inner squad competition next Thursday so they are getting ready. After gymnastics, we went to the Montclair Plaza and bought some SEES candy for my grandma. Then we ate dinner in the food court, and got a smoothie (corn free) on the way out. My little one told me it was the best Valentine’s Day ever. After that we did her grocery shopping and went back to my grandma’s. We didn’t get home until about 10pm. That’s pretty typical for our Thursdays. So despite my mistake at lunch we had a nice day. Katie's Daily Life is a participant in the Amazon Services LLC Associates Program, an affiliate advertising program designed to provide a means for sites to earn advertising fees by advertising and linking to Amazon. com.